Generally one tablespoon of powder is added per cup of water, but sometimes as much as a half a cup of powder (eight tablespoons) is added per cup of water to increase potency. The powder is then soaked in water for approximately 30 minutes to allow the water to completely soak through the powdered fibers. Lecithin,a waxy like ingredient derived from soybeans, is often added to aid in the process of emulsifying the kavalactones with water. Blend the kava powder, lecithin and water in a blender for several minutes then strain into a cheesecloth or nylon straining cloth. The Fiji traditional method: With the powdered pulp enclosed within the straining material, (large muslin bags are good for this) the pulp is usually massaged for five to ten minutes within the beverage by soaking it then wringing the liquid out, then soaking again and repeating, applying pressure to release the most kavalactones. The liquid will have a muddy, opaque and yellow appearance, and will begin to feel oily. 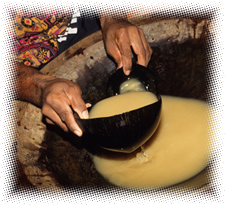 Once the kava solids are strained and pressed out, the kava is ready to enjoy. Kava needs a lot of help in the flavor department, try adding coconut milk, cocoa, sugar, or soy milk to improve flavor.